With new and advancing technologies in the automotive world, some of the leading vehicle manufacturers in the “sport” class have developed an entirely new breed of sports car. These new vehicles are the results of decades of technological engineering, making them some of the most high-performing vehicles in their class. They are also so affordable that anybody can feel like a racecar driver. In other words, these are some of the most impressive white-collar cars, for a blue-collar budget. Volvo has always had a place in the category of affordable, sporty sedans. The newest S60 comes in several trims and with two engine types supported by an AWD system. The first, being the most affordable, is a 2.5 liter 5-cylinder, turbocharged engine, which produces 250 horsepower and 266 lb-ft of torque for just $35,650. The second engine type that Volvo produces for the S60 is a smaller 2.0 liter 4-cylinder engine powered by both a turbocharger, similar to the 2.5 liter, and a supercharger. This smaller engine produces a massive 305 horsepower, and 295 lb-ft of torque. Unfortunately, the more powerful engine pushes the S60 over our price range, coming in at $44,400. Hyundai’s Genesis is undoubtedly their most impressive vehicle, aimed at a more luxurious market than a sports car, but even with its tasteful exterior and extravagant interior, it’s still a very affordable sports car that offers a fairly decent, optional AWD system. The Genesis is marketed at $38,750. It’s powered by a massive 3.8 liter naturally aspirated V6 that produces a very impressive 311 horsepower and 293 lb-ft of torque. The Genesis is definitely an option for the person who likes a kick when pressing down in the pedal, but who doesn’t want to give up all the amenities. Volkswagen has turned their Golf into one of the most versatile vehicles they’ve ever made, with almost five different types of Golf, and various trims for each. The Golf has turned into a car for almost anybody. However, the one that we’re interested in is the most highly performing model, the Golf R. This is the only Golf that comes standard with AWD and produces the most power off the lot. As one would expect, with the most power and features comes the highest price of all the Golfs. Coming in at a minimum of $35,650, the Golf R is still decently affordable for the average person. The most recent model of the Golf R comes with a 2.0 liter, inline 4-cylinder that produces an impressive 292 horsepower and 280 lb-ft of torque. Keep in mind that the Golf is one of the most easily tunable German made vehicles on the market and would have no problem exceeding those stats if you’re willing to void some warranties and spend a little money. The new Ford Focus RS has surpassed the status of “hot hatch” and stands to be one the highest performing vehicles in its class. The RS far exceeds any and all expectations for not only its class, but also several classes above it. The “RS” meaning “rally sport,” comes from a long line of rally and performance vehicles, but has recently adopted a more practical day-to-day design. For instance, this hyper hatch comes off the lot with 345 horsepower and up to 347 lb-ft of torque and is matched up with Ford’s inspiring new AWD system, which quite simply changes the way people look at AWD vehicles. The idea behind the system is to essentially leave the car as a front wheel drive vehicle until there is traction loss. Ford’s integrated AWD then pushes up to 70% of the power to the rear wheels through its rear differential. The interesting thing is that depending on what setting you have the car on, the rear differential can then supply up to 100% of that power to either, or both, wheels. And if you don’t quite know what that means, it’s easily summed up in two words: “torque vectoring.” The RS utilizes this system in all of its modes, making it seem like it’s either impossible lose traction, or like it was never meant to driven straight. With so many other features, and impressive qualities to this car, it absolutely comes in as the top pick for just under $37,000. But that’s if you can get your hands on one; these bad boys are only imported and are very limited in the US so I tip my hat to whoever finds him/herself sitting behind the wheel of one on a regular basis. As one of the most iconic and inspiring AWD vehicles in its class, the Subaru WRX STI has no trouble securing its spot on this list. The newest model of the STI still comes with its standard 2.5 liter turbocharged Boxer engine that produces a healthy 305 horsepower and 290 lb-ft of torque. The STI may not have the most impressive specs, but this car has never been known for its impressive on paper numbers. With a few tools and minimal mechanical experience, anybody can turn this iconic rally racer into a force to be reckoned with. Subaru has recently separated this entry from its Impreza pedigree, making it an entirely different car and ultimately letting Subaru execute some serious interior upgrades. Subaru also manufactures one of the leading AWD systems in all classes, meaning the STI will let you take it through turns at such high speeds you would hardly be able to resist smiling from ear to ear. For just over $35,000 the STI is definitely something for those who want a car that is capable of so much more than driving on the streets. 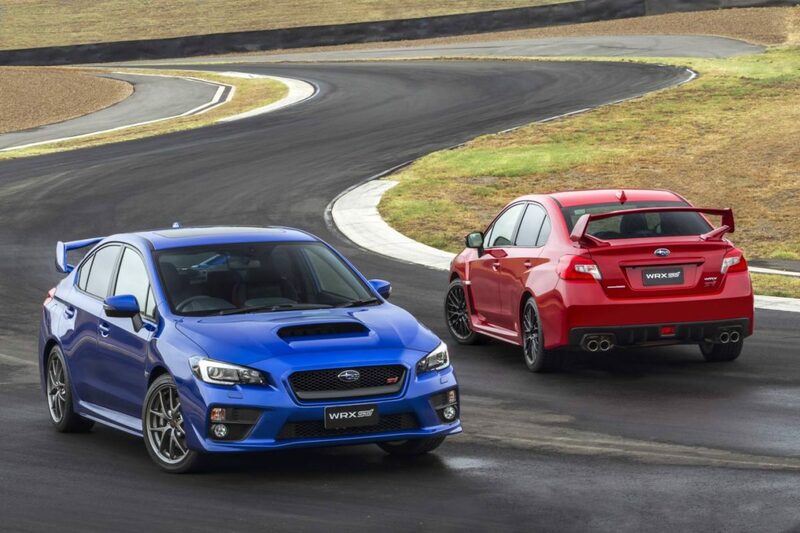 Unlike its big brother, the WRX now comes with a smaller 2.0 liter turbocharged engine that pushes 268 horsepower and 258 lb-ft of torque, which is significant enough to be placed in the same category as the STI. However, where the WRX really shines in the shadow of the STI is with its 0-60 time, which is only .2 seconds slower than the much more expensive model. This is because the WRX is lighter due to how much less tech it involves, and because of the gear ratios, which are longer, letting the WRX stay in its power band longer without changing gears. With that in mind, and knowing that the less aggressive WRX is only $27,000, the real question is: “Is that .2 of a second worth that $8,000?” The decision is a personal preference one, but the WRX may be the buyer’s choice in this case.